Decision making: Educating your intuition/Being fast and smart: -I discuss people’s anecdotal ideas about when intuition works; several exercises where the mind is fooled, and discuss how individuals and companies can educate intuition and improve their decisions. I also do a more focused talks, drawing on these points, on ‘hiring the best’. Persuasion: Communications that move people: What are your most challenging persuasion problems? I analyze how people inadvertently structure their conversations in ways that are highly unpersuasive, and focus on how to manage people’s egos, ask powerful questions, and make it easy for people to say yes. I also do related sessions on managing polarizing conversations and deescalating conflict. Networks: Expanding your opportunities, creativity, and ‘luck’ through your relationships. My TED talk focused on some of these points. Negotiation: Win-Win Value Creation: Getting comfortable with claiming value, questions that help you create value, get past no, and crafting mutually beneficial outcomes. Gender and leadership: Managing backlash when you are confident, assertive, and powerful woman leader; clear communication without apology. I also do related talks on diversity and inclusion, and managing a global work force. Collaboration, creativity, designing smart teams: You may have smart people but are they a smart team? I discuss ways to design a team to ensure quality participation, accountability, and productive conflict, so you can learn from each other. Tanya Menon is Associate Professor at Fisher College of Business, Ohio State University. Her research on decision making, influence, culture, teams, and networks has been cited in various media outlets including the Wall Street Journal, Boston Globe, The Economist Intelligence Unit, The Times of London (UK), The Guardian (UK), and The Times of India. She has taught courses on Persuasion, Negotiations, Power, and Organizational Behavior and was the winner of the 2013 Best Elective Award at the Ohio State University’s Fisher School of Business. 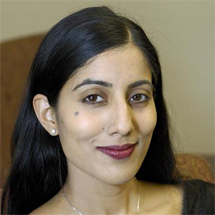 Menon formerly was Associate Professor at the University of Chicago Booth School of Business in Behavioral Science, where she was a member of the Center for Decision Research, and an affiliated faculty member in the Psychology department. At the University of Chicago, she won the 2006 Faculty Excellence Award for exceptional commitment to teaching, and the 2007 Phoenix Award, for enriching the experience of students inside and outside the classroom. She has additionally been a visiting professor at Northwestern University’s Kellogg School of Management, Cornell University’s School of Industrial and Labor Relations, Indian School of Business, London Business School, and INSEAD. She has conducted executive programs all over the world, including the US Intelligence Community, Discover Financial Services, DHL, Cummins, Express, Scotts, Citibank (India), Tetrapak (Italy), Aetna, Erie Insurance, CareerBuilder.com, National Starch, Baker-Tilly, McCormick, and the Environmental Protection Agency. She has been a keynote speaker at organizations including Society for Hospital Epidemiology of America, American Bar Association Chief Bar Executives, Ronald McDonald House Charities, and the Deloitte Women’s group. Prior to graduate school, Menon was a research assistant in INCAE Business School in Costa Rica and an intern in Morgan Stanley's London office. Menon earned a bachelor's degree in sociology from Harvard University in 1995 and her Ph.D. from Stanford Graduate School of Business. She is currently Associate Editor at Management Science Journal.